Reviewed by Justin Wedeking, Department of Political Science, University of Kentucky, justin.wedeking@uky.edu. For many Americans, if not most, the primary virtue of the judiciary is the belief that judges will make decisions grounded in “the law” that are compelled by precedent and previously established procedures. A core part of this belief, regardless of whether it comes in a concrete or abstract form, involves the nature of how judges’ decide cases and explain their reasoning, often drawing on philosophies that are marked by formalism, such as originalism or some other decision process that purportedly produces principled decisions. In fact, some might argue that this process plays a key role in enhancing and maintaining the legitimacy of the courts. In REFLECTIONS ON JUDGING, however, whatever notions or hopes you might have entertained that judging is a mechanical, straightforward and uncomplicated process that consists of judges deciding cases in a formulaic and impartial manner are quickly disposed of by Judge Richard Posner. The book is an eclectic and meandering mix of thoughts on his career and experiences. The book also provides philosophical advice to new judges, along with guidance to lawyers, and also includes his thoughts on how various aspects of the legal system should work. In all of this, several prominent themes emerge that should be familiar to those who are already familiar with Posner’s writings. Among these themes, perhaps the most prominent are those that focus on the growing complexity that judges must face, and a strong call for realism and pragmatism in judging. This leads to what I think is one of the disappointments of the book, the sparseness of novel material and the lack of an overarching theme that directly and explicitly connects all of the chapters. With that said, it is nice to have a variety of his material collected in one place and in some areas there is an effort to have the various parts and chapters “speak” to one another. In what follows, I summarize the arguments made in each chapter, as they are varied and not always directly related to each other. I will generally try to avoid offering comments along the way, though this will not always be possible. Following my summary I offer a few more comments and conclude with my recommendations for the book’s future use. The book has twelve total chapters, with ten of them being “numbered” chapters that are bookended by non-numbered introductory and concluding chapters. The book’s introductory chapter reviews several ideas and concepts that appear throughout the book. Specifically, Posner reviews legal formalism and legal realism, and the two kinds of complexity- internal and external – that he addresses later in the book. Posner then offers some thoughts on why his reflections might be valuable and a brief “roadmap” of the remaining book. Chapter 1 fills in some background about his childhood and how he became a judge. This chapter is filled with interesting stories and anecdotes. For example, I found it [*93] fascinating to hear how Posner selected Yale as his undergraduate institution, referring to the decision on where to attend college in an almost matter-of-fact manner that showed little concern over his potential future career path and no acknowledgment of the difficulty of getting into the institution. In this chapter, his personality is on full-display, and in this chapter his point of view becomes known almost immediately, if it was not known already. Chapter 2 offers a summary of the changes in staffing of the federal judiciary, though he does not offer any real or detailed analysis of these important changes. The main argument of this chapter is that there needs to be better management of the federal judiciary. In this chapter Posner is very critical of the Supreme Court, offering very sharp criticism of several Court decisions without bothering to offer much detail behind why they are problematic. At the end of the chapter Posner makes a provocative point that he calls a paradox- staff quality can degrade judge quality, and after offering a few loosely connected thoughts on the subject he ends with a point about how the “potential effect on the quality of Supreme Court appointments is disturbing to contemplate” (p. 53). This may be the case, perhaps, but a skeptical reader who needs a little more convincing might find the persuasiveness of his arguments to be in need of further development. And a little empirical evidence would go a long ways here. Chapter 3 is a long chapter and it jumps directly into Posner’s arguments about complexity. Posner sees two kinds of complexity: internal and external. While he explains these types of complexity in an earlier chapter, it is helpful to review them in the context of this chapter. External complexity stems from the environment that generates cases, which can include such things as the economic, political, or technological environment. Posner sees external complexity as increasing, creating more difficulty for judges. Important to understanding Posner’s argument, judges have little or no control over external complexity. The problem arises in how judges choose to deal with growing external complexity, which leads to internal complexity. In contrast, internal complexity is when a task is made more complex and mysterious in order to retain and elevate an occupations status. Posner gives an example of when a formalist judge wants to use a complex style of legal analysis (e.g., the canons of construction) to resolve cases without having to understand factual complexities. 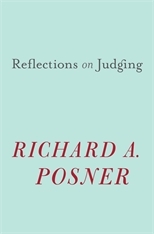 According to Posner, internal complexity is generated by judges, having been abetted by lawyers, law professors, law clerks, and legislators, who “complexify” the legal process “needlessly” in order “to avoid the struggle to understand the complex real-world environment that generates much of the business of a modern court” (p. 4). Posner sees the two types of complexity as related but that judges can only have influence over internal complexity. Much of the chapter is spent trying to explain and disentangle his ideas of complexity. The examples told here are detailed, coming primarily from criminal law and sentencing, and offer insight and support for his arguments. Though to what extent it is [*94] systematic support is left unanswered. Other prominent themes of this chapter include commentary on the growing external complexity, the lack of concern shown by judges for the “real world” that we live in. There, he makes a legitimate point about the educational background of judges and justices, noting that they “reflect a general belief that law is a humanity rather than a social science” (p. 81). Next, he briefly offers his thoughts on whether specialization is a solution. Perhaps unsurprising, he argues against it as he asserts that specialized courts are not working. Posner concludes the chapter by railing against the Bluebook citation manual as a source of bureaucratic pressure in response to growing complexity. Chapter 4 is a quick chapter that offers more description of a “formalist” and a “realist” judge at the appellate level. Posner ends the chapter by giving advice to new appellate judges. Here, Posner makes an argument for how a new judge should interact with his or her clerks. He believes in using first names, ignoring the age or status difference. In addition, he argues for an open and deliberate style in debating cases, to the point where each clerk should be able to speak candidly without fear. This seems like sound advice though it is unclear to what extent it is practiced or carried out as it is described. Chapter 5 criticizes the appellate record as being inadequate. Much of the chapter is spent criticizing formalism for the constraints it imposes on gathering information that may help resolve a case. Posner argues that judges should do more internet research to supplement the case. Posner is careful to avoid arguing that the “appeals court should not make its decision turn on a fact found outside the court record unless the fact is incontestable” (p. 136), but it is not always clear where a judge should draw the line. Posner also makes an argument for the use of pictures and maps in the appellate record. Here, I think Posner makes, through the use of examples, a strong argument for their inclusion. In Chapter 6 Posner discusses a passive strategy (or what he calls a “coping strategy”) for dealing with the growing complexity in cases- judicial self-restraint. Posner focuses on one type of self-restraint, which he defines as “a marked reluctance to invalidate legislation on constitutional grounds” (p. 150). In this chapter, Posner makes a clear stand that judges can no longer avoid or escape dealing with external complexity by creating internal complexity. In this chapter he reviews and discusses James Bradley Thayer’s theory of constitutional restraint, which he views as the best-developed version of restraint. After reviewing the rise and “death” of Thayer’s theory, at the end of the chapter he laments that today’s Supreme Court justices (or any other judge) pay no heed to it. In Chapter 7, Posner continues on his theme of “coping strategies” for judges by exploring interpretation, to which Posner includes textualism, originalism, literalism, and historicism. The first part of this chapter attempts to explain the logic and rationale behind this mode of judging, while the second half severely criticizes it. Much of the criticism takes the form of pointed [*95] critiques against Scalia and Garner’s recent arguments on originalism. While the bulk of this chapter makes valid points, much of it is constructed in a seemingly haphazard fashion, jumping from critique to critique, making it difficult to gain a unified or broad understanding of why Posner does not like originalism. One concrete example where Posner does a good job of identifying one objection to originalism is on page 194 where he analyzes Scalia’s reasoning in the HELLER gun rights case. Following this lengthy treatment, Posner shifts gears to tackle Amar’s book, AMERICA’S UNWRITTEN CONSTITUTION, which Posner views as espousing the opposite of originalism, which he views as being just as problematic. Posner offers several critiques of it, and then for the remaining chapter discusses his philosophy- realist interpretation. Chapter 8 documents his views on opinion writing and appellate advocacy. Here, he reviews what he considers to be “bad” writing and then discusses the process of opinion writing, comparing and contrasting the “writer model” to the “manager model,” which delegates most work to the clerks. Posner clearly favors judges writing initial drafts before circulating to clerks. At the end of this chapter Posner makes a bold move by demonstrating how he thinks opinions should be written. Specifically, in an appendix he reprints an opinion from the D.C. Circuit Court of Appeals, US V. MORRIS, 977 F.2d 617 (D.C. Cir. 1992), which is 3,237 words long and then he includes a draft version of how he would have written the opinion, which is 602 words long. I give him credit for this, as it clearly shows he is willing to try and make a point. However, it is limiting in that we do not have guarantees on whether his opinion would have compelled others to sign on, nor if it would have achieved compliance. In other words, Posner ignores two key aspects of opinions when making his critique: (1) coalition pressures to opinion writing that often come in the form of requests or suggestions to add language to the opinion; and (2) whether a shorter opinion can offer the degree of specificity that is needed to ensure compliance by the affected parties. Chapter 9 details a hodgepodge of Posner’s thoughts generated from his experiences in District Court. A dominant theme of this chapter looks at how complexity relates to the role of expert witnesses and their unreliability, the jury, and internet research being done by jurors. After reflecting upon the arguments in this book, it becomes clear that there are several useful ideas in here for judges, lawyers and law students. Importantly, it is written at an accessible level where most anybody can understand what Posner is arguing in any given chapter, assuming some background knowledge of the law and structure of the federal court system. While Posner claims that he “mixes the academic with the personal” (p. 11), this book is written more in a personal style with relatively little academic rigor found in it. To be sure, perhaps that is why it is thought provoking and interesting to read. In addition to these brief thoughts, it is worth noting that when attempting to critique such an esteemed figure that it is difficult to come up with original yet useful ideas. With that in mind, I offer some comments about some of Posner’s arguments. Perhaps the first comment is more one of writing style, but it has a clear connection to the structure and presentation of a written argument. Posner repeatedly argues for the importance of clarity. I share that concern with Posner. To that end, this book could have achieved a more lucid message if there were an argument that explicitly connected all of the chapters together. In other words, if Posner spent more time on the organizational layout of the book, including explicit “signposts” and establishing more connections between chapters and how each chapter connects to an overarching theme, it would be useful. A second critique of the book stems from how Posner presents his argument that realism is the answer. If one repeats it enough, that alone does not make it enough. Moving beyond anecdotal evidence to a more systematic examination would do more to advance his argument. And while I generally agree with Posner’s arguments on the benefits of realism, I do not find his mode of presentation very persuasive in convincing the reader. While Posner is skillful at finding examples that illuminate the benefits of realism and problems with formalism, along the way there is a tendency to slip into the abstract, where passages come off as vague and ambiguous, even when Posner is trying to avoid that. This is ironic because Posner advocates for a “more simple approach” and therein lies the rub. Advocating for a more simplistic approach seems a bit elementary when he spent the better part of the book playing up the challenging and growing “complexities” of society. A third comment arises when he is criticizing formalist writing. A small point occurred to me that perhaps Posner is missing some of the benefits that it may confer. Specifically, Posner rarely stops to reflect on the legitimacy of courts in the work they are doing. Perhaps more troubling, he does not seriously consider if there is a connection that may exist between the type of jargonistic language that he rails against and the possible benefits it may provide in conferring legitimacy. When judges are rooting their decisions in doctrines and precedent, they are calling upon a form of legal symbolism that is perhaps critical to helping the public accept decisions they do not agree with. While doctrine and precedent are not visual symbols, they are clearly part of the [*97] symbolic understanding that so many Americans tend to share about the court system. I recommend that book for any undergraduate or graduate class that focuses on jurisprudence, as well as any class that has a focus on the development and evolution of law and judging. In addition, it is a must read for anyone who wants an introduction into realism and some of the problems inherent in originalism. Furthermore, law students would also benefit from reading the book, as there is plenty of good advice on the practical aspects of lawyering and advocacy. Amar, Akhil. 2012. AMERICA’S UNWRITTEN CONSTITUTION. New York: Basic Books. UNITED STATES V. MORRIS, 977 F.2d 617 (D.C. Cir. 1992). © Copyright 2015 by the author, Justin Wedeking.